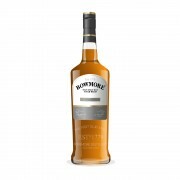 Bowmore Small Batch was initially launched in 2012 under the name “Small Batch Reserve” but was renamed “Small Batch” one year later. It is entirely matured in first-fill and second-fill ex-bourbon casks and appears to be vatted in limited quantities; however I could not find any batch number on my bottle. The nose is lightly smoky, with plenty of cereal and milk flavours. Later on there are notes of lemons, vanilla, as well as a touch of cinnamon. The palate is light-bodied and smoky. The cereal and vanilla flavours are back, together with wood spice, a good dose of salt and followed by a whiff of menthol. The finish is of medium length. Smoke and vanilla flavours combine for a well balanced ending. I was positively surprised by this Bowmore. I loved the malty and milky nose with the soft smoke in the background, and the palate – although a lightweight – manages to convincingly pair up fruity and salty elements. This is rather well done and a good example of a more modern version of Bowmore. Works for me!